Claudette Colvin (born September 5, 1939) is a pioneer of the civil rights movement. On the day of March 2, 1955, she was the first person arrested for resisting bus segregation in Montgomery, Alabama, preceding the more publicized Rosa Parks incident by nine months, although not as well known. It's my constitutional right to sit here as much as that lady. I paid my fare, it's my constitutional right. 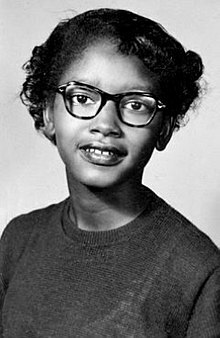 Claudette Colvin at biography.com, accessed 2 Nov 2013; Colvin said as she was getting arrested by the two police officers on the bus. Claudette Colvin at biography.com, accessed 2 Nov 2013. I felt like Sojourner Truth was pushing down on one shoulder and Harriet Tubman was pushing down on the other—saying, 'Sit down girl!' I was glued to my seat. This page was last edited on 28 February 2019, at 17:35.